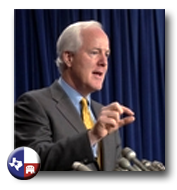 *Note: Today, 21 United States Senators led by Senators John Cornyn (R-Texas) and Orrin Hatch (R-Utah), Ranking Member of the Senate Finance Committee, introduced a Balanced Budget Amendment to the United States Constitution. The proposed amendment would bring down the nation’s skyrocketing national debt by requiring balanced budgets and prohibiting deficit spending or tax increases unless approved by two-thirds of the House and Senate. Millions of working families across the country balance their checkbook every year, and their government should do the same. That is why passing a Balanced Budget Amendment must be the first priority of the 112th Congress. We are facing a fiscal crisis, and everyone agrees that our nation is on an unsustainable path. Unfortunately, Washington has a track record of failing to get its own books in order. We must set effective limits on spending, taxes, and require a balanced budget. I am proud to join Sen. Hatch, who has led the fight for a balanced budget amendment for years, in this effort. It is my hope that the Majority will join us and make this a top priority for the 112th Congress. Bringing down our sky-high debt is in the economic, national security and public interest of our nation. Time after time, Washington has promised to bring down the debt, but then kept the spending going – increasing the mountain of debt our kids and grandkids will have to pay for. A Balanced Budget Amendment is a sure fire way of making sure we end that dangerous cycle,” said Hatch. “I’ve long fought for a Balanced Budget Amendment and hope that given the tremendous fiscal crisis facing our nation that its time has come. This strong group of Senators backing this amendment demonstrates to the American people how serious we are about getting our fiscal house in order. The national debt is now more than $14 trillion and has increased by more than 25 percent in just the last two years. The Congressional Budget Office (CBO) says the public debt is already nearly two-thirds the size of our economy and could equal an astonishing 90 percent in just 9 years. The Senate came within one vote of approving a similar amendment put forward by Hatch in 1997. The Balanced Budget Amendment has been cosponsored by Senators Saxby Chambliss (R-Georgia), John Ensign (R-Nevada), Mike Enzi (R-Wyoming), John McCain (R-Arizona), Mike Crapo (R-Idaho), Chuck Grassley (R-Iowa), Olympia Snowe (R-Maine), Jim Inhofe (R-Oklahoma), Johnny Isakson (R-Georgia), Roy Blunt (R-Missouri), Kelly Ayotte (R-New Hampshire), Richard Burr (R-North Carolina), Rob Portman (R-Ohio), John Barrasso (R-Wyoming), Mike Johanns (R-Nebraska), Mark Kirk (R-Illinois), Pat Roberts (R-Kansas), Richard Lugar (R-Indiana), and John Hoeven (R-North Dakota). It has also garnered the support of the American Conservative Union, Americans for Tax Reform, National Taxpayers Union, and Ken Blackwell, the National Chairman of Pass the Balanced Budget Amendment. Mandates that total budgetary outlays for any fiscal year not exceed total revenues. Caps federal spending at 20 percent of GDP. Requires the President to submit a balanced budget to Congress every fiscal year. Requires two-thirds vote in both the House and Senate on any measure that raises taxes. Provisions can be waived if there is a formal declaration of war, if the U.S. is engaged in a military conflict constituting a threat to national security, or if two-thirds of both the House and Senate approve.